I’ve been a UFC fan since I watched the very first tournament on VHS which I rented from Superior Video in Duncan British Columbia. So it is a surprise it has taken me this long to finally see some live fights, but lets just say a lot of things have not gone well the last ten or so years. I enjoyed the event I would have enjoyed it more if I had better seats but coworkers refused to commit early enough or come through with tickets like they said so I had to get them myself not at the last minute, but close enough to the event that I got one of the last pair of tickets in the lower bowl. 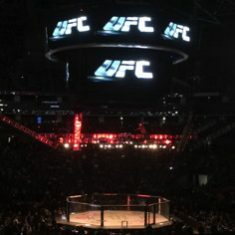 Mercedes-Benz Arena in Shanghai is very nice, the UFC puts on a great show even if this show was lacking a little in star power it was the first event in Mainland China so it had a very loud crowd to support the local fighters. There were also a lot of expats cheering on Brazilians, Russians, even the French. Some Americans were booed but not because they were American but because they either wrestled too much or committed a foul. Chinese fighters lost several early fights, but Song Yadong defeated the first Indian born fighter signed to the UFC and the bigger name Chinese fighters all won so they will get a further push likely at the next UFC in Asia. I am definitely willing to travel to see another UFC and almost went to Macao, Korea, and Japan but I’m tired of traveling alone and I am still poor, so if you know someone who is hiring take a look at my resume. UFC Shanghai would have been better with hot food or beer. I did managed to tweet and upload a selfie to Instagram. I also took a few more photos but I have to upload them and write more about my staycation and tour guide duties in Shanghai. UFC Shanghai was actually last month but I have been busy studying, working, and looking for a new job. Tonight I allocated time to updating my blog. Hopefully in 2018 I get a new job, I’m definitely buying a new laptop. If you attended UFC Shanghai and wrote about it leave a link below, my connection at Reebok tells me it was a two year deal so the UFC will be back in Shanghai in 2018, hopefully I can attend again. This entry was originaly posted on December 21st, 2017 , it was last edited on April 17th, 2019 and is filed under: Sporting Life and tagged: China, MMA, Shanghai, UFC.